A jewell with a real tahitian cultured pearl is an excellent idea for all kinds of occasions that will delight all women of all ages and personalities. The tahitian pearl still symbolizes the charm of Aphrodite and would stimulate will and self-esteem. We are in Tahiti in the southern Pacific Ocean. The territory consists of 118 islands of which only 76 are inhabited. The 5 archipelagos extend over a surface as large as the United States. The island of Tahiti is located about 2500 miles south of Hawaii, 3700 miles east of Australia and 4000 miles from Los Angeles. Our atolls are the only ones to produce the black pearl of Tahiti which comes from a mother-of-pearl called the Pinctada margaritifera. Since the beginning of the 20th century this oyster is sought for its shell whose mother of pearl is splendid and with which one also manufactures jewelry. It will take several years to harvest a pearl with 100% natural colors. Pearls are not really black but have shades of gray, silver, brown, and sometimes shades of blue, mauve and gold are rarer. Pearls are born in pearls that are living organisms. Their good growth requires regular control and a good balance of the lagoon environment. Some shellfish are banned for export because they are the natural predators of a starfish that devours corals and weakens the lagoons. Some microorganisms also destroy the nutrients and limit the growth of nacres. Many atolls can no longer produce pearls because pearls can no longer grow there. The buyers are mainly big companies that sell the pearls in their luxury shops. Today, thanks to the submarine telecommunication network coming from the island of Hawaii, we use the power of the internet to communicate directly with our customers, without going through these big companies. .
By buying on our shop earringspearls.com you are guaranteed to receive genuine Tahitian pearls and not freshwater pearls that that could have been artificially darkened by colorants, silver nitrate or gamma rays. We deliver directly from Tahiti to your home by post. Choosing a gift is usually complicated for reasons of budget or uncertainty about the quality of the materials. 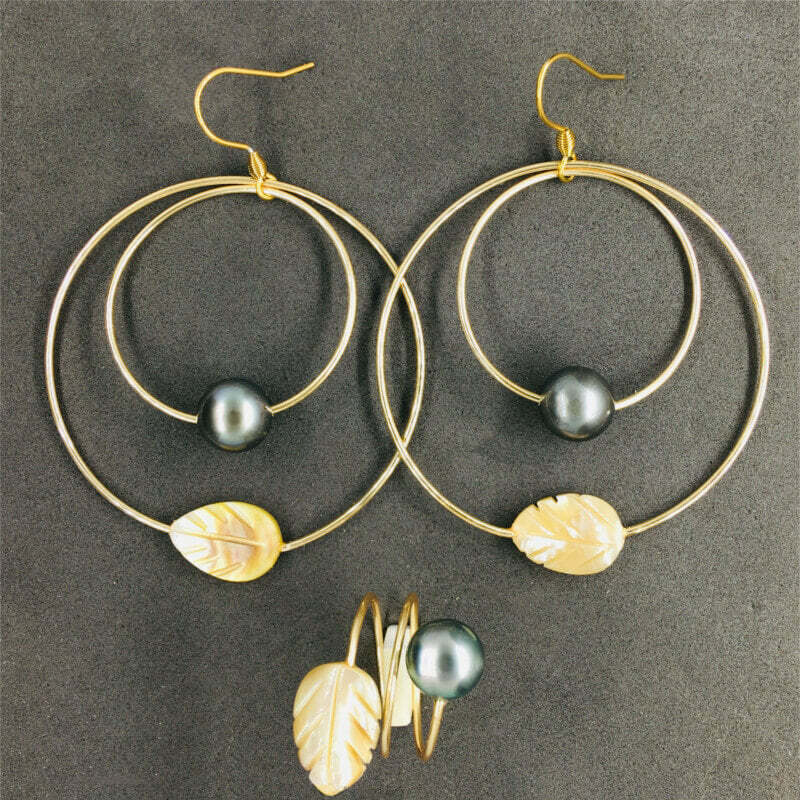 The Tahitian pearl is a luxury product because it is a natural product that requires several years of cultivation. The colours of our pearls are 100% natural. A jewel with a real Tahitian cultured pearl is an excellent idea for all kinds of occasions that will delight all women of all ages and personalities. The Tahitian pearl still symbolizes the charm of Aphrodite and would stimulate will and self-esteem. Pearls, shells, leaves, flowers and other carved shapes are made from natural products and their colours may vary slightly. 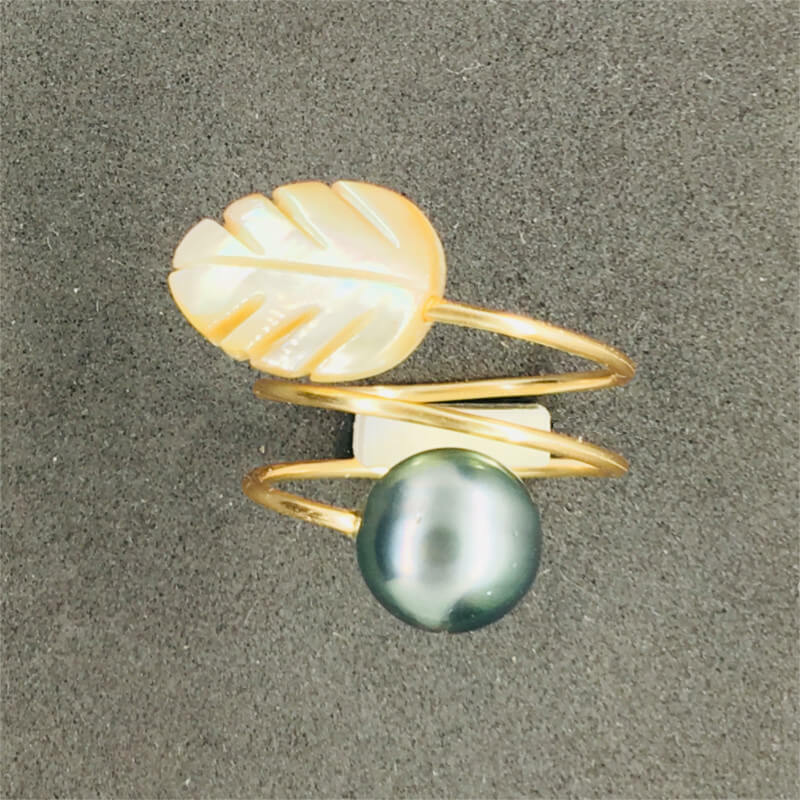 This model is composed of a real Tahitian cultured pearl about 9 mm in diameter and a carved leaf in golden mother-of-pearl with white and orange highlights. Rhodium electrolysis protects some materials against oxidation and tarnishing. The rings of our rings and earrings are perfectly adapted to jewellery and resist oxidation and tarnishing. For your satisfaction and your budget we offer a range with rings in gold filled, sterling silver or stainless steel for jewelry. Please note that due to the different lighting of computer monitors and tablets, colors may vary. Most orders are shipped directly from our desk in Tahiti within 24-48 hours for your convenience and maximum efficiency. For worldwide customer. Your product will arrived within 2 weeks average depends on your shipping address. The only downside is our product is not and industrial product and it can out of stock in our desk. Don't worry, we have our product pearl farm on atoll and we will contact direct us for any delay ship unless we already indicated on the product page "sold out". We offer a 100% satisfaction guarantee or your money back if our product is missing or damaged. Please contact us for return requests. For more information click on the Return Policy link at the bottom of the page. Our shop uses SSL technology which offers you maximum security, especially on data protection for online banking. We offer a payment by credit card Amex, CB, Visa, Master Card. All our services are fully secure. Your item will be processed for shipment within 2 business days. 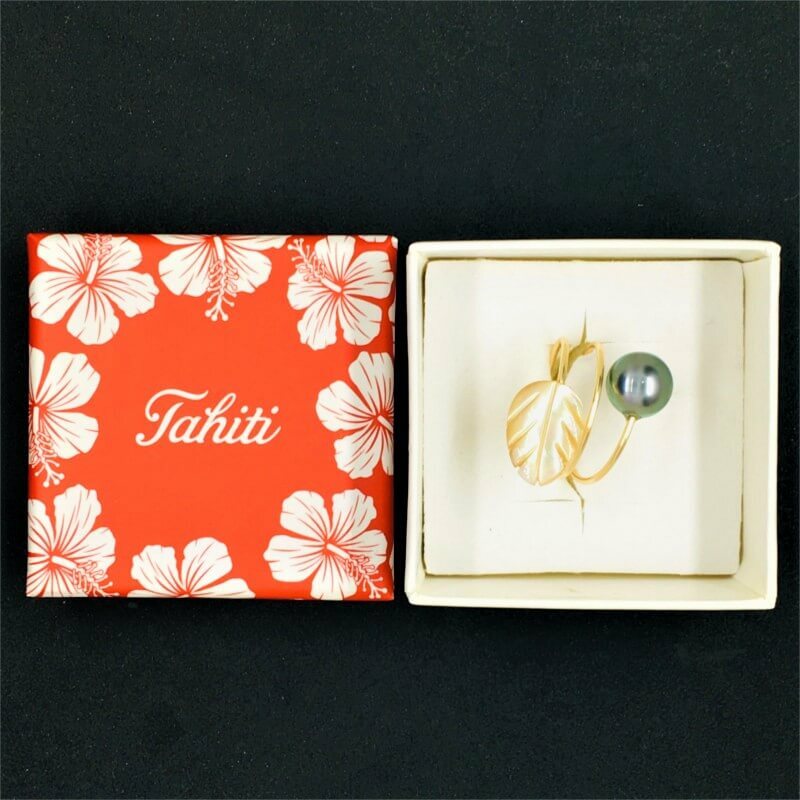 Our products are shipped directly from the Tahiti in the South Pacific. A tracking code can be sent to the email address you registered with. Allow approximately 2 weeks for delivery. Please check the accuracy of your address. If your package does not arrive, or arrives damaged, please contact us by clicking on this "contact" link. The team is committed to providing you with an answer within 24 hours. To contact us, click on the "contact" link at the bottom of the page or click on the "Messenger" button located at the bottom right of the pages of the site. I would like to offer this product to a loved one? You enter your address in the "Billing address" field and you will specify your relative's address in the "Delivery address" field. Make sure to check the accuracy of his address (We do not put an invoice in the package).